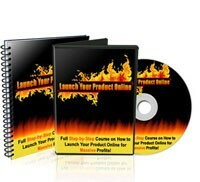 "Full Step-by-Step Course on How to Launch Your Product Online for Massive Profits!" Description: Straight from the minds of successful product launch executors, and combined with the powerful Private Label Rights, this multimedia audio/video course is jam-packed with profit-raking information - walking from A to Z on how anyone can pull off their own product launches on the Internet successfully. This is the premise of Launch Your Product Online as this is a direct conception from the mind that pulled off 11 successful product launches in just 2 years! • Product Launch Criteria - a quick checklist on whether your product or service meets the requirements of a potential 6 figure launch! • The 3 stages in product launch - all are just as important! Most failed product launches are owed to weak areas in one or more of these stages. • How to build buzz and generate interests - get a list of pre-buyers lining up via your Advanced Notification List before your launch day! • Launch like the top guns! How to convince and get Joint Venture partners to willingly promote your launch. • How to create a continuous stream of income even after the launch is over, and make money over a long tail period of time!